Converts text from ASCII to other formats, etc. almost always require a great deal of manual "cleaning up"
to get them into the desired format. indents, centering, tab stops, etc. intact. only) which simplifies the selection of processing options. document formatted properly on the new word processor. formatters like NROFF (as long as they use "dot"
tables, etc. and will avoid reformatting them. problems if they are imported to a word processor. any specific number of blank lines you wish. for math symbols, letters from foreign alphabets, etc. file and how you can control these changes. chances are that TEXTCON will help. an even higher level of performance than TEXTCON itself. put into developing and supporting it. will display the legal options. another word processor, it will probably contain gibberish. results because of their new meanings. input file is single- or double-spaced. some paragraphs to run together in the converted file. normally TEXTCON will handle this correctly. rerun TEXTCON without these options. 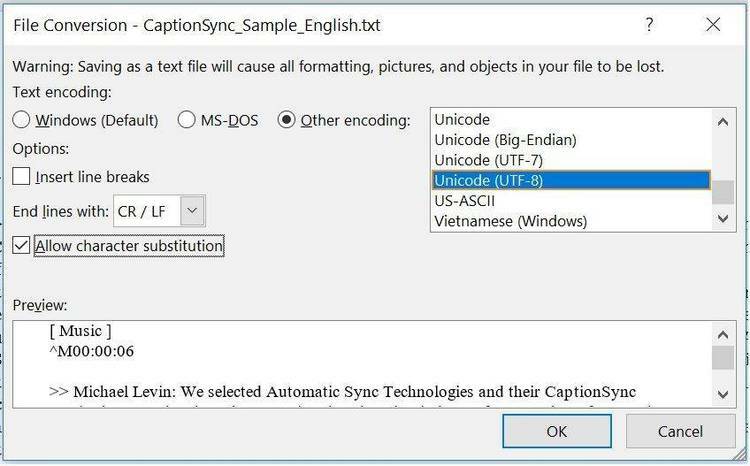 any file that has been created using this option. taking advantage of all of its formatting abilities. neither a straight ASCII file nor a true WordStar file. had no line-ending required hyphens.
. The only ASCII values not allowed are 0 and 255.
kept; the -K option allows this. all spaces in the converted file. trailing spaces from each line it processes. incorporated into the paragraphs of text. paragraphs) in the converted file. case, leaving only two in the converted document). It also tries to recognize print-image files, i.e. describing the file as "page-formatted". all carriage returns in the converted file. message "All carriage returns will be preserved." conversion, without its carriage-return stripping. codes kept, use the C sub-option. -T0), specifying the number of spaces between tab stops. value of zero (-T0) means they are removed entirely. example, the item "3. -I#" just below). is found in the original file. convert indented paragraphs to block-style paragraphs. already block-style or have hanging indents. paragraph spacing is either too large or too small. be lists or tables whose spacing should be preserved. for your document and from this calculates a "cutoff"
length used in its paragraph-determination algorithms. be as much as 10 or 15 characters longer. returns and add others, which it cannot currently do. tables, but it cannot set the positions for the tab stops. thus saving some additional time. each line with a tab, rather than using an indent command. suitable tab value (usually 5 is a good choice). using a numeric value that is less than the shortest line. who has used it successfully on a DEC Rainbow. will not accept them without the line feeds. formatter. In this case, TEXTCON will remove "dot"
c. TEXTCON deletes trailing blanks from each line. d. WordStar files are always converted to ASCII. difficulty for some PCDOS software. -KBCS to keep other characteristics of the file intact. The -Z# option overrides the -KR option. with tabs exapnded to spaces. them as fully indented paragraphs. WordStar, Word Perfect, and Microsoft Word. must be redone on the target word processor. cation of where they are referenced. document for maximum flexibility in reformatting. file; they will have to be retyped on the NBI. form. Do not use the Print command to create this file. no way to get it back. relatively few rules for you to follow. appear in the middle of the text that references them. WordStar files can be converted very effectively by TEXTCON. but it generally gives a better translation. sors and optical scanners to an NBI Oasys office system. This was the first version to be widely distributed. 1. Renamed the former -L option to -B. 2. Changed the -T# option to use true tab stops. 2. Added new -L# option, as well as -H, -Y, and -R.
and header and footer locations. 4. Fixed a bug in the table-recognition section. of improvement in recognition of WordStar files. However, see the new -W option below. will split files with long lines into shorter lines. control codes are to be kept in the new file. preceded by a line without a line feed. fine tuning for better paragraph recognition. bility for losses arising from their failure to do so. be accompanied by this documentation file. program, which is described elsewhere in this documentation.